How can scalp micro-pigmentation (SMP) create a cleaner, more stylish look for shaved heads? The pigment, known as a ‘stable chromophore’ is tattooed into the dermal layer (second layer of the skin which does not shed like the first layer of the skin) using a multi-needled pigment device. Tiny incisions are made into the scalp through which pigment is distributed carefully, dot by dot, over the area affected by hair loss until the whole area is covered. The size of each pigment dot depends on the desired look, the natural behaviour of the individual’ skin and surrounding hair and the pressure applied by the hand of the practitioner. Who is SMP ideally for? Is SMP painful to have applied? 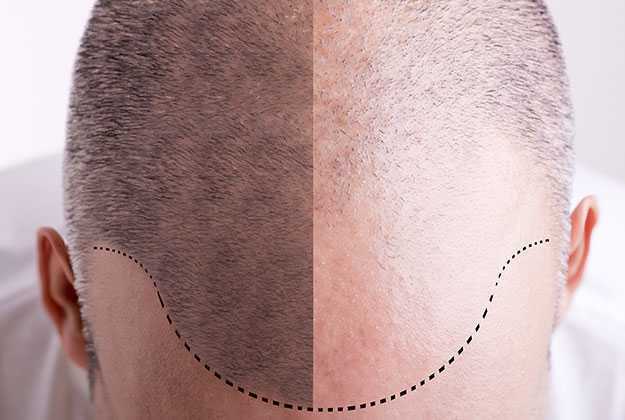 Scalp micro-pigmentation is not considered very painful by hair loss patients and most describe it as ‘no more painful than a regular tattoo.’ Sensitivity to the potential discomfort is also known to become reduced with each regular treatment, much like waxing. How long does SMP last, typically? Unlike hair transplant, scalp micro-pigmentation treatment is non-surgical and therefore may need to be readdressed every six months or so to keep the look fresh and the layers of colour natural-looking and clearly visible. There is a natural level of fading which occurs a few days after every treatment (much like a regular tattoo) and is to be expected. Following that, the pigments will, depending on scalp care, come to fade very much more gradually and most men opt to have further treatments to keep their desired look neat and natural. How can I keep my scalp micro-pigmentation looking great? Avoid pro-longed periods of direct sunlight/hot sun-bathing periods. SMP skin needs to be moisturised regularly and the natural colour created by the pigment will fade faster if the skin has cause to renew itself after long or repeated periods of tanning. If you are out and about use a hat where possible and an effective SPF cream which blocks the heat. Follow post-treatment advice which will in most cases tell you to avoid heavy scrubbing of the head, swimming, and excessive sweating for four weeks after each treatment. Wearing a hat such as a cap for twelve days post treatment is also advised. If you’re in any doubt as to the best care tips, ask your specialist. Avoid certain hair or skin products such as those which are alcohol or bleach-based. These may include for example some products aimed at treating acne which contain benozyl peroxide or some hair products or creams which contain alcohol. Be sure to check labels and do the research.